You know you’re obsessed with baking when you describe to a friend that watching the stages of creaming butter and sugar is a “euphoric experience.” Luckily that friend was none other than my co-blogger Chef Edwin, so he did not report me to the authorities and the men in white coats never came to get. From very early in my baking career I began seeing the phrases “cream butter,” “cream butter and sugars,” or “cream until light and fluffy.” Of course, I had no idea what this meant, and I heard a variety of explanations when I asked others. If that’s not a battle cry, I don’t know what is. I withdrew from law school in 2006 after realizing very early on that law school and I were incompatible in every way. It was one of the best decisions I’ve made. I have not opened a bakery (yet? ), but clearly I have great respect and admiration for Warren Brown (Mr. Brown, if you need a new spokesperson, please contact me). But back to creaming – creaming aerates your cake batter and adds bubbles to it, making it light and fluffy instead of dense or tough. 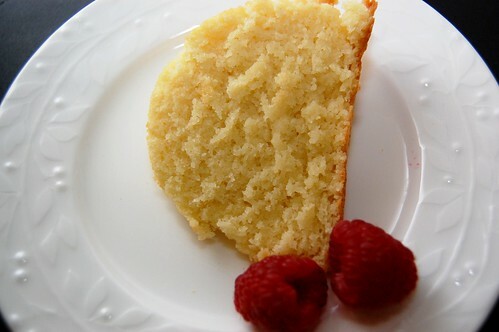 It also allows your cake to rise and develop a great texture. The absolute best way to do it is to combine room temperature (not microwaved) butter with your sugar(s) in a stand mixer on the lowest speed using the paddle attachment (not whisk). If you don’t have a stand mixer but you see a good deal of baking in your future, then consider giving the economy a little boost and investing in one. I use it constantly. Do not rush the creaming process. As the sugar pushes through the butter you’ll see the volume slightly increase as the mixture becomes fluffy, light yellow and a little grainy. 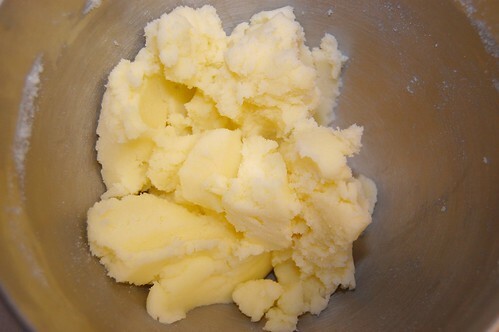 Creaming should take at least 3 minutes; do not turn up the speed on the mixer any higher than low. If you don’t have a stand mixer, do your best with electric beaters. You really can’t get the same effect trying to do this by hand. Also, creaming is not a concern for brownies or cookies. When done properly, as I said above, watching the butter and sugar push and pull and become fluffy is so satisfying! You will make some truly mouth-watering cakes. And if at first you don’t succeed – keep plugging away! Hi! I'm having trouble making cookies and I'm pretty sure that the problem is creaming the butter. The last time I tried , I used a stand mixer, the butter was at room temperature and i used white sugar and brown sugar. The thing is, my stand mixer doesn´t have a paddle attachment, only whiskers and another one, for breads and other heavy batters. Does it really make a big difference? What else might be wrong? Can you help me out? please! Hmm… well, I think that using a whisk attachment instead of the paddle attachment might make a difference, but I don't know that it would make or break your cookies. With cookies, it is important not to overbeat the butter and sugar – perhaps that's where you're running into trouble? Overbeating will cause your cookies to spread and flatten while baking (unlike cakes, where you can't really overbeat the sugar and butter). Did you chill the dough before baking? Chilling also helps prevent the cookies from flattening – you can refrigerate them anywhere from 30 minutes to 2 days before baking. I know it's hard to wait, but baking without chilling just encourages the already warm butter to just fall flat. Hope that helps – please let us know how it goes! Well, I think I´m not overbeating the butter and sugar, because it didn't even get to the stage where it is light and fluffy. I didn't chill the batter before baking, however the second batch of cookies was only baked 2 or 3 hours after the first batch and meanwhile the batter stayed in the fridge. And still, the cookies were flat. Well, I will try again whenever I can, than I let you know if it worked. Hi! I know it’s been a long time but I’m back. I found out what was going wrong with my cookies, I was using margarine instead of butter. I don’t know if that’s was the only reason, but after I started using butter the cookies came out perfect 😀 And not flat at all. I love those Chicago cafeteria butter cookies and decided to make them myself. Unfortunately they not turn out as expected. I used a handheld mixer as I’m not really into baking, I was visiting out of town and a local church was selling them. The cookies did not brown and they fell apart. The handheld mixer has a whisk and not a paddle, does it make a difference for butter cookies. I also used un-salted butter .. any suggestions? A whisk will introduce a different amount of air than a paddle during the creaming process (more, I believe), but that shouldn’t be a deal breaker. You can still bake great cookies. There are a lot of reasons a cookie can fall apart. It’s possible you’re overbeating and introducing too much air, but it could also be you’re adding too little (or too much!) flour. The same goes with butter. Depending on the recipe (baking really is a science), an excess of butter can cause them to spread out more as they bake. Browning is no different. It could be your oven, the temperature, the amount of time you bake them, the actual dough… Sorry if that’s not much help! My cookies always come out great. I am not a chef, but what I have noticed is that if the butter is not kept at room temperature you start to have separation of the butter from the cookie dough. I always refrigerate my cookie dough for at least an hour. I also had to play around with where the rack was placed in my oven, the temperature, and the length of time my cookies cook. It will vary slightly but it will make all the difference. Also I am using two cookie sheets I never bake more than 1 cookie sheet at a time. I found my cookies don’t cook the same with more than 1 cookie sheet. Also once my cookies are out of the oven I immediately transfer them from the cookie sheet to a rack to cool so they cookies don’t continue to cook from the heat of the cookie sheet. I then rinse my cookie sheet under cold water for a few minutes to cool the cookie sheet. If you place cookie dough on a warm cookie sheet the butter starts separating. Also if after I place all the cookie dough on the cookie sheet and my other cookies are not ready to come out of the oven I put that sheet in the fridge until it’s ready to go to the oven. Chef any comments on this?